Pinot Grigio. One of the most popular and recognisable styles of wine in the UK at the moment as it has been for the last few years. The bulk of what most people mean when they talk about Pinot Grigio comes from the Veneto region of north east Italy where it is grown in huge quantities and then sold on to large bottlers. This bulk production results in wines that tend to be very neutral in character. Whilst I understand that this is partly the appeal – a wine that can be drunk easily and without much thought making it a relatively safe buy for the under confident wine-drinker – I think it is a shame that we should repeatedly resign ourselves to drinking a wine which at it’s very best can be described as inoffensive. I have beef with Pinot Grigio. Pinot Grigio is in fact the Italian name for a French variety called Pinot Gris. As a grape it is pretty fantastic; subtle, soft, peachy characteristics, more weight on the body than you’d expect from a ‘Pinot Grigio’ and with a hint of mineral spice – it can result in some really excellent wines. In France you are most likely to come across Pinot Gris from the Alsace region but there are an increasing number of New World offerings which are definitely giving the French a run for their money. As a rule these better quality wines are predictably going to be a little more expensive but considering you often end up paying £7.99 (an EXTORTIONATE AMOUNT) for a tasteless watery Pinot Grigio I think it’s well worth a bit of hunting around and a couple of extra quid for a wine that is seriously worth the money. Last night I drank a bottle of the Cave de Beblenheim Pinot Gris Reserve which I bought for £9.49 from Waitrose. 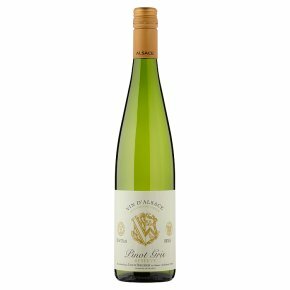 This was a lovely example of Alsace PG at its best – ever so slightly off-dry, this would have been a fantastic wine to match with Thai food, especially a Thai green curry. The gentle spice in the wine also would compliment the aromatic spice of the curry – delicious. A new world example in a similar style would be the Tim Adams Pinot Gris on offer at £8.25 from Tesco. This is from the Clare Valley in South Australia, a region with a multitude of soil types, altitudes and climates, producing some very high quality wines. An old favourite of mine and a wine that really offers fantastic value for money is The Ned Pinot Grigio which has just come on offer at Majestic for the bargain price of £7.99 (when you buy 2 or more). It comes from Marlborough, New Zealand (usually better know for their Sauvignon Blancs) and is owned by the renowned winemaker Brent Marris. The warm days and cool nights mean the flavour characteristics become concentrated in the wines giving it more of a tropical fruit character than its European contemporaries. In terms of food matching you have so much more scope with a better quality Pinot Grigio/Gris than you do with the typical, bland Pinot Grigios we usually buy. They will be great with lighter seafood or fish dishes but can also stand up to an array of Asian cuisine and more full-bodied, creamy dishes as well. Of course if it says Pinot Gris on the label it’s easier to tell more or less what you’re getting but if it says Pinot Grigio I would steer clear of anything from Veneto. Experiment with some New World offerings and I think you’ll discover a whole new side to Pinot Grigio. So please please, if your picking up a bottle of wine this weekend, try to resist the Pinot Grigio you’d normally go for and try something new. I take full responsibility if it doesn’t work out for you but a rather suspect it will.